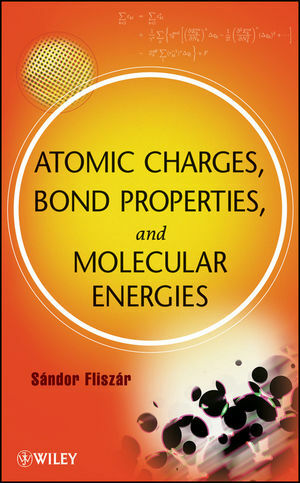 The first book to cover conceptual quantum chemistry, Atomic Charges, Bond Properties, and Molecular Energies deftly explores chemical bonds, their intrinsic energies, and the corresponding dissociation energies, which are relevant in reactivity problems. This unique first-hand, self-contained presentation develops relatively uncomplicated but physically meaningful approaches to molecular properties by providing derivations of all the required formulas from scratch, developed in Professor Fliszar's laboratory. This book is vitally relevant to organic- and biochemists, molecular biologists, materials scientists, and nanoscientists. SÁNdor FliszÁr, PhD, is Emeritus Professor of Chemistry at the Université de Montréal. His research focuses on thermodynamics and quantum chemistry. Dr. Fliszár is the author of more than 140 publications, including two books. He has been an invited lecturer at the University of Ottawa, Université Pierre et Marie Curie, Université de Reims Champagne-Ardenne, Università degli Studi di Napoli Federico II, and Università della Calabria. 1.1 The Bond Energy Model. 2.1 The Hartree -Fock Approximation. 2.2 Hartree -Fock -Roothaan Orbitals. 3. Core and Valence Electrons. 3.2 Atomic Core and Valence Regions. 3.3 The Valence Region Energy of Atoms. 4. The Valence Region of Molecules. 4.2 The Core -Valence Separation in Real Space. 4.3 Formula for the Valence -Region Energy. 4.4 Interface with the Orbital Model. 4.5 Approximation for the Valence Energy. 4.6 Perturbation of the Valence Region. 5. Inductive Effects; Atomic Charges. 5.4 Selected Reference Net Atomic Charges. 6. Atomic Charges and NMR Shifts. 6.3 Merits of Charge -Shift Relationships. 6.5 Relationships Involving sp3 Carbon Atoms. 6.6 Relationships Involving Olefinic Carbons. 6.7 Carbon Bonded to Nitrogen or Oxygen. 6.8 Correlations Involving N-15 NMR Shifts. 6.9 Correlations Involving O-17 Atoms. 7. Charges and Ionization Potentials. 8.1 The Standard Mulliken Formula. II. CHEMICAL BONDS. ENERGY CALCULATIONS. 9.2 Zero -Point and Heat -Content Energies. 10. The Chemical Bond: Theory (I). 10.4 Bond Energy: Working Formulas. 11. The Chemical Bond: Theory (II). 11.1 Valence Atomic Orbital Centroids. 15.1 Amines: Charges of the Carbon Atoms. 15.2 Nitrogen Charges and Bond Energies.